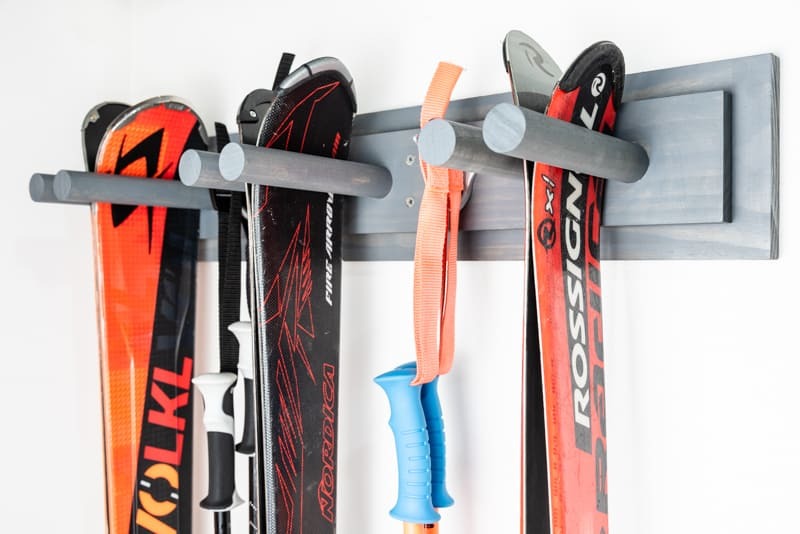 Get your skis off the floor and onto the wall with this easy to make garage ski rack! 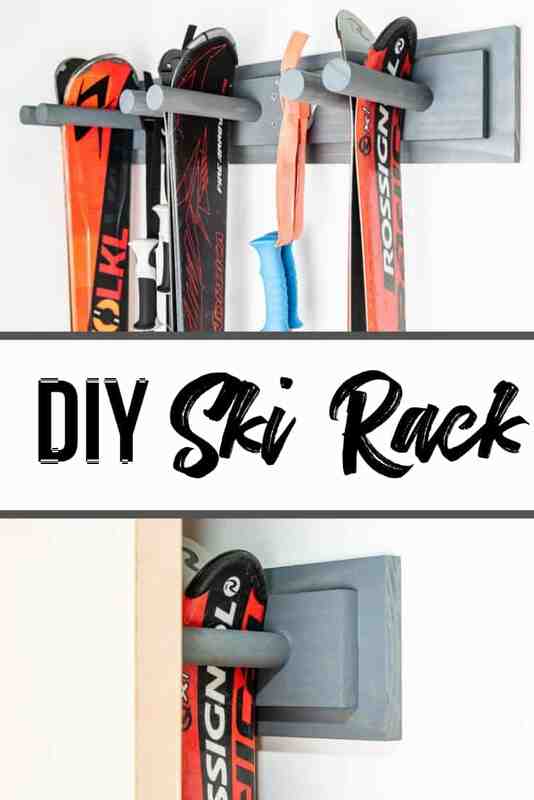 Customize this DIY ski rack to fit all your gear behind the door! Ski season ended rather abruptly with a few random 70 degree days in the middle of March this year. I’ve been itching to clean up the yard, but the snow gear was still strewn all over the place from the last trip to the mountains, blocking the way to the lawnmower and garden tool storage rack. 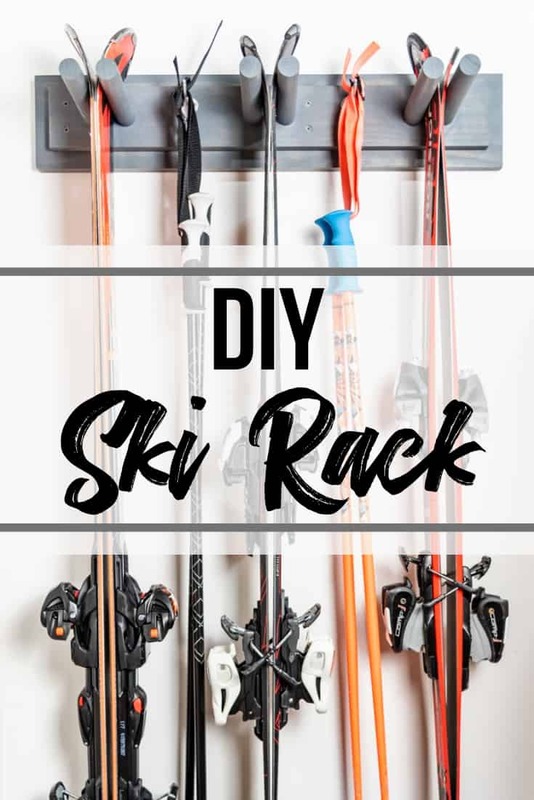 This DIY ski rack fits behind the garage door and gets all our skis and poles organized and off the floor! 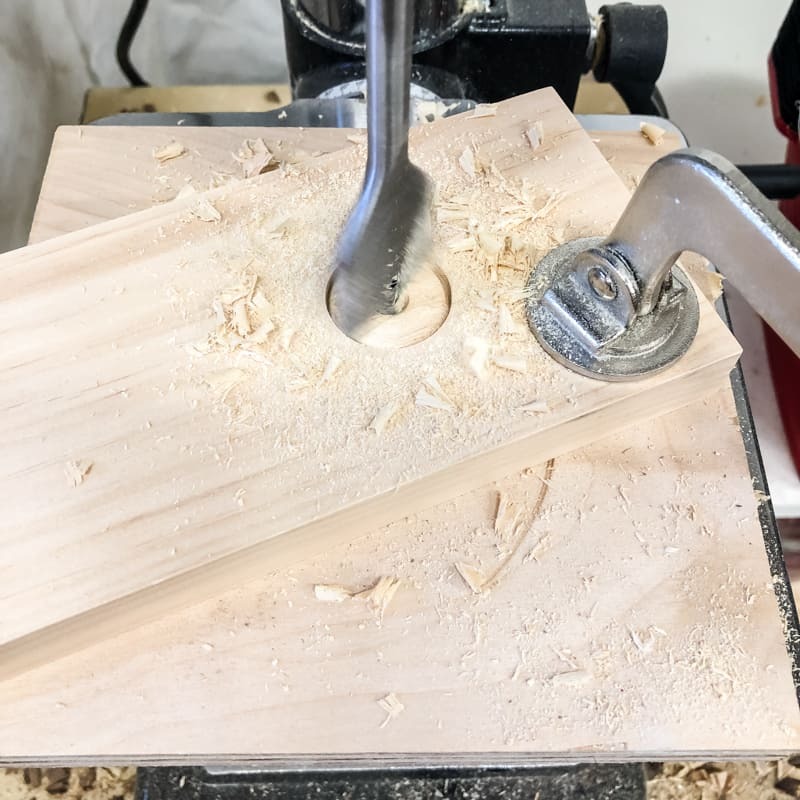 With small projects like this, I always turn to my scrap wood pile first! After measuring the space behind the door next to the garage shelves I just built, I dug out a 1×6 and a 1×4 board of roughly the same length. I also had some 1 1/8″ round dowel end cuts and a few old coat hooks that I unearthed when I cleaned out this area a couple weeks ago. I love it when I can make a project for free! 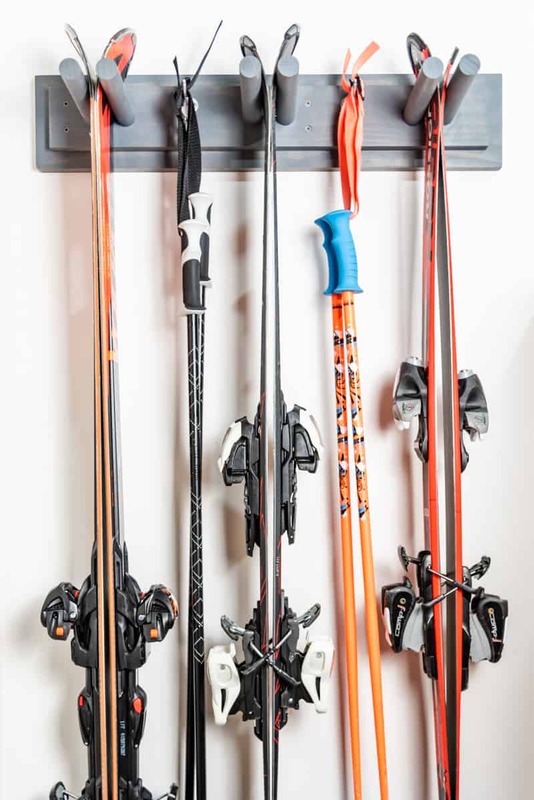 The size of your ski rack depends on how many sets you need to store, and how much space you have on the wall. We needed room for three sets of skis and two hooks for poles, which will fit nicely behind the door. I used a stud finder to mark the position of each stud in the wall. Then I transferred the stud markings to the 1×6 board. If your board will only hit one stud, make sure to mark where you plan to insert drywall anchors instead. 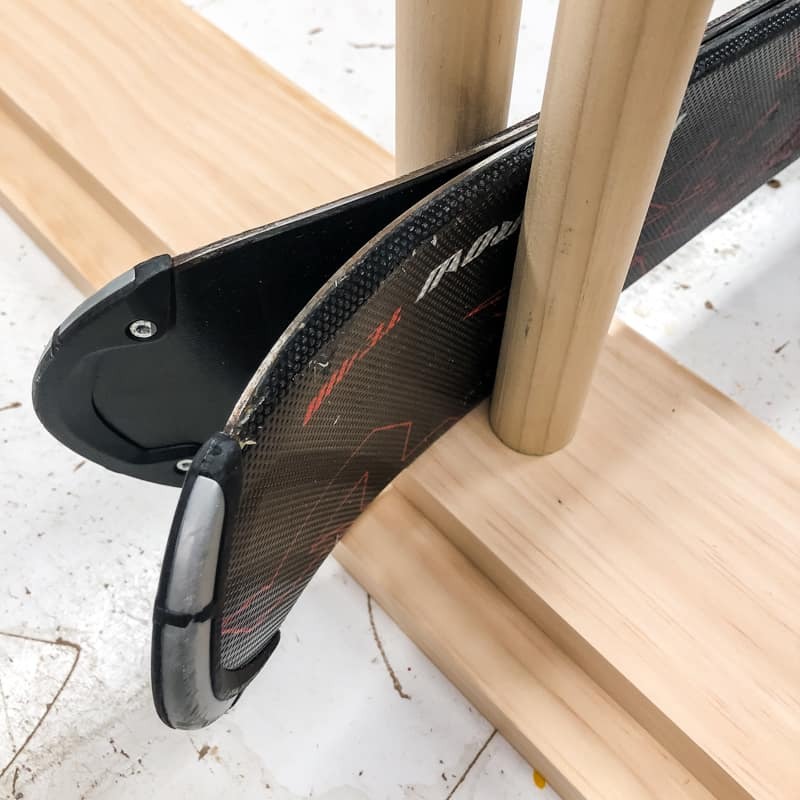 I’ve seen similar DIY ski racks that use dowels that are sunk only partway into a 1x board. I was worried that might not be strong enough to hold up our heavy skis, so I decided to double it up with a 1×4 on top. The 1×6 is 28″ long and the 1×4 is 26″. The 1×4 board will have holes drilled all the way through, so the wood glue will have plenty of surface area to adhere to. 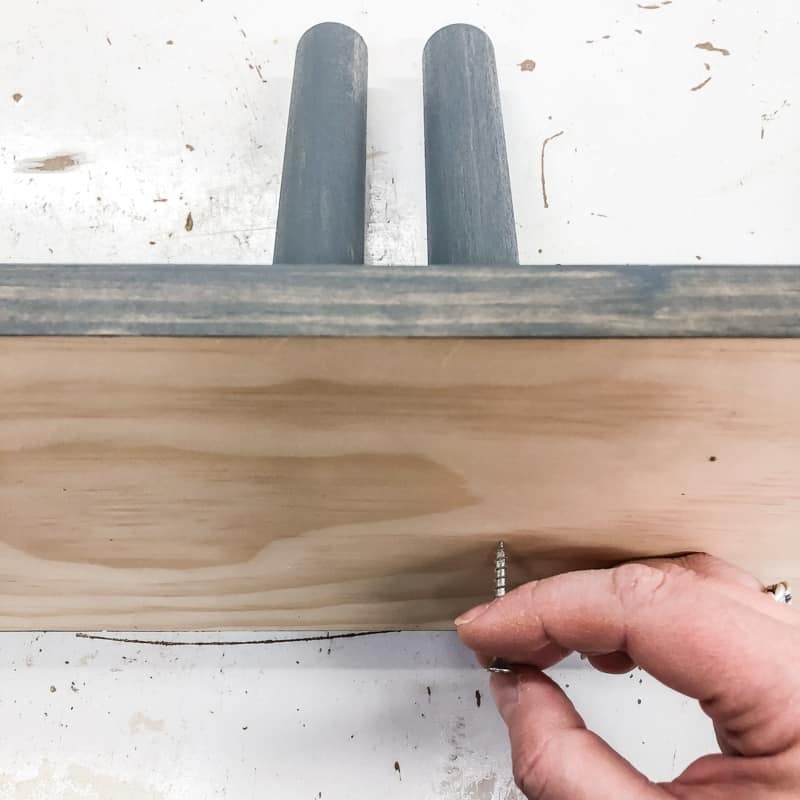 The 1×6 board will serve as a backing, and you can even screw through the back of the 1×6 and into the dowel if you want them to be really secure. I had a bunch of dowel end cuts that I found in a toolbox buried in the back of the garage storage area. The shortest one was 7 1/2″ long, which turned out to be the perfect size for my husband’s wide-tipped skis. I cut five more to match. My son’s skis have more camber (the arc under the center of the ski), so I used those to determine how far apart the dowels should be. 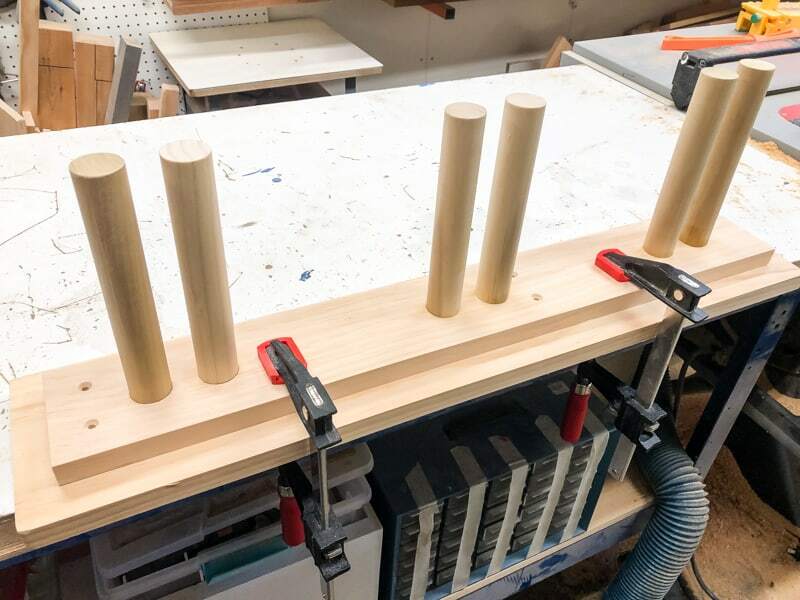 I positioned the skis tight between two upright dowels, then measured the space between them. It turns out 3/4″ is just about right! I marked the center of the 1×4 board and the stud locations. Then I placed a scrap of 3/4″ lumber over the center mark, with dowels on each side. 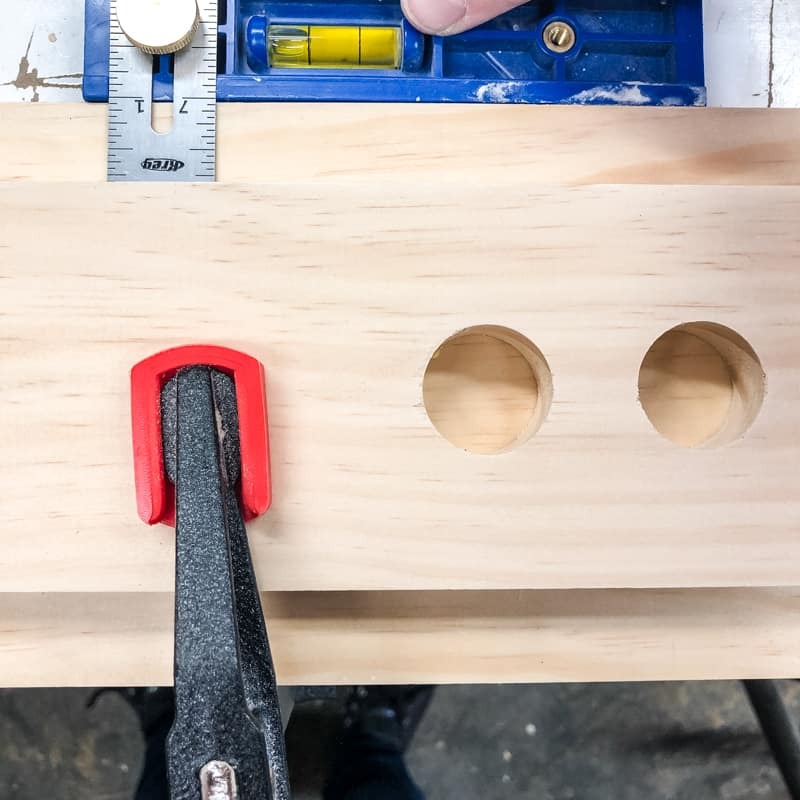 This helped me decide where to drill the holes for the dowels while avoiding the studs. Once you have the positions of all the dowels marked on the 1×4 board, it’s time to drill some holes! 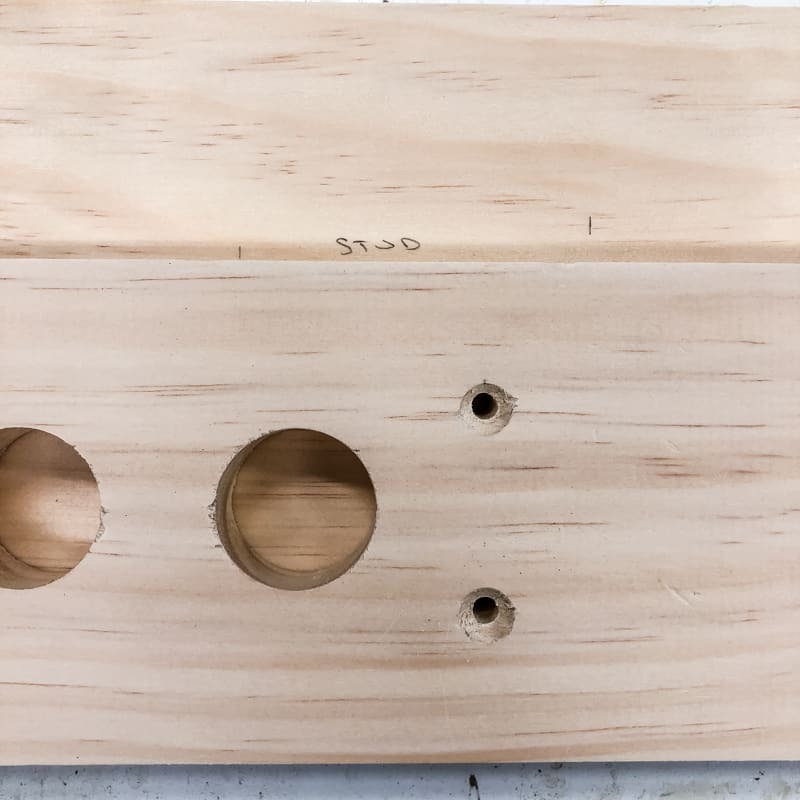 Use a 1 1/8″ paddle bit or Forstner bit in a drill or drill press to make holes all the way through the 1×4 board. Then predrill two countersink holes at each stud location. These screws will go through the 1×6 backer board and into the wall. 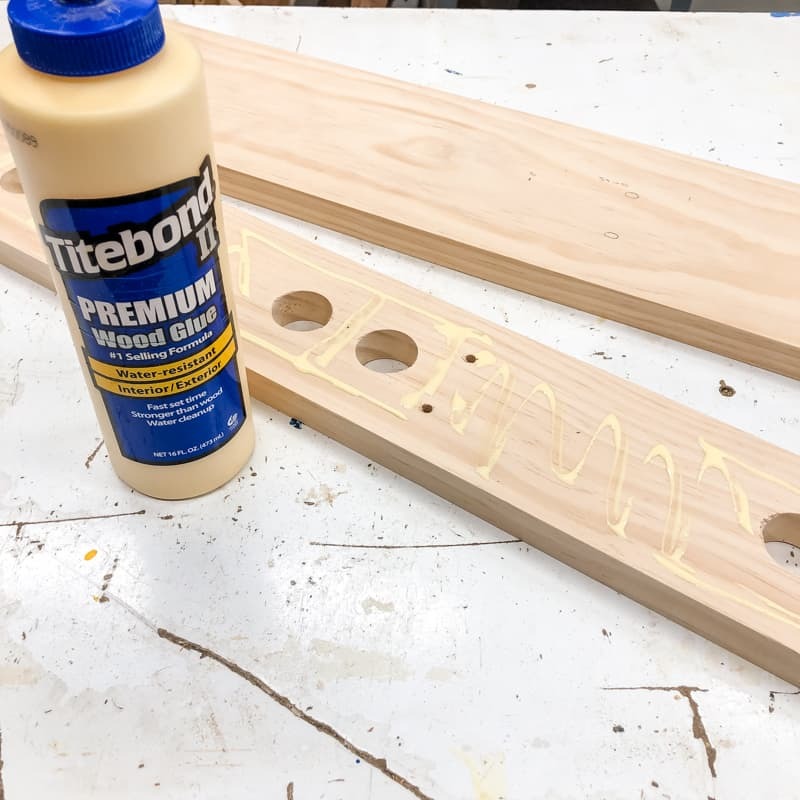 Flip the 1×4 with the dowel holes over, and apply wood glue to the back. Place it on top of the 1×6 board with a 1″ offset on all sides. Clamp it down to the workbench. 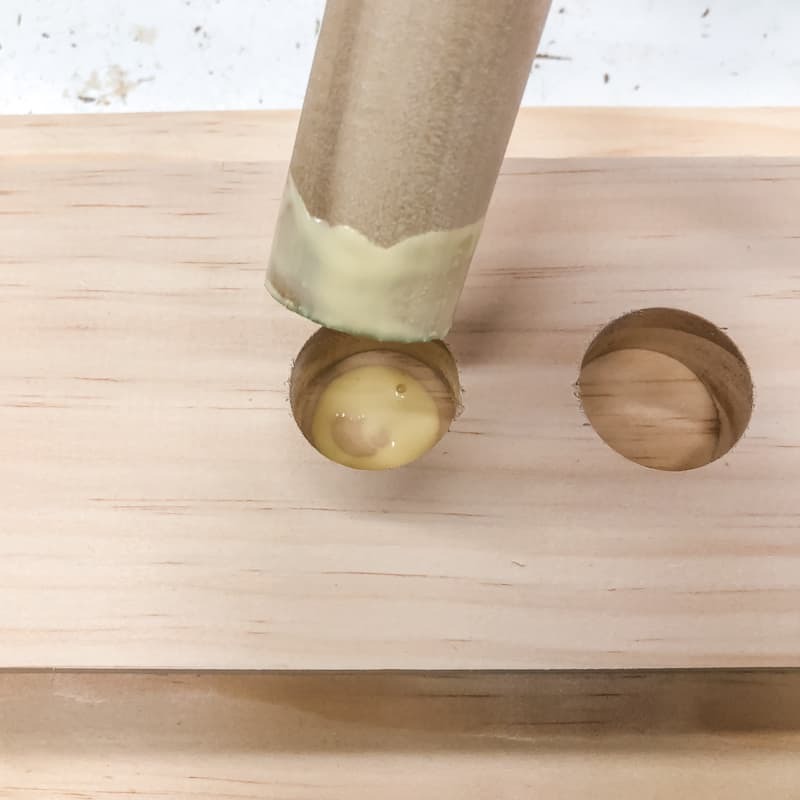 Add a squirt of wood glue to the bottom of each hole, and use your finger to spread glue around the bottom of each dowel as well. 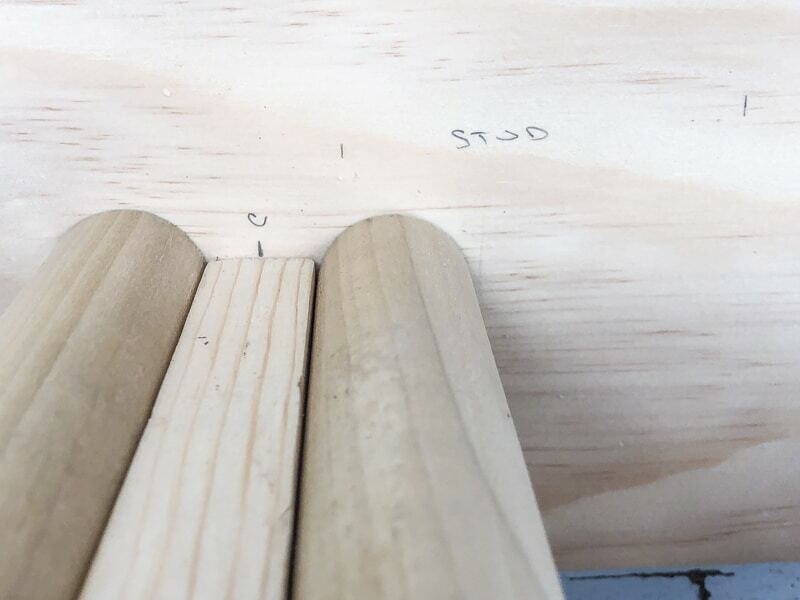 Insert the glued-up dowel into the hole, making sure to clean up the glue squeeze out as you go. Let the wood glue dry overnight. 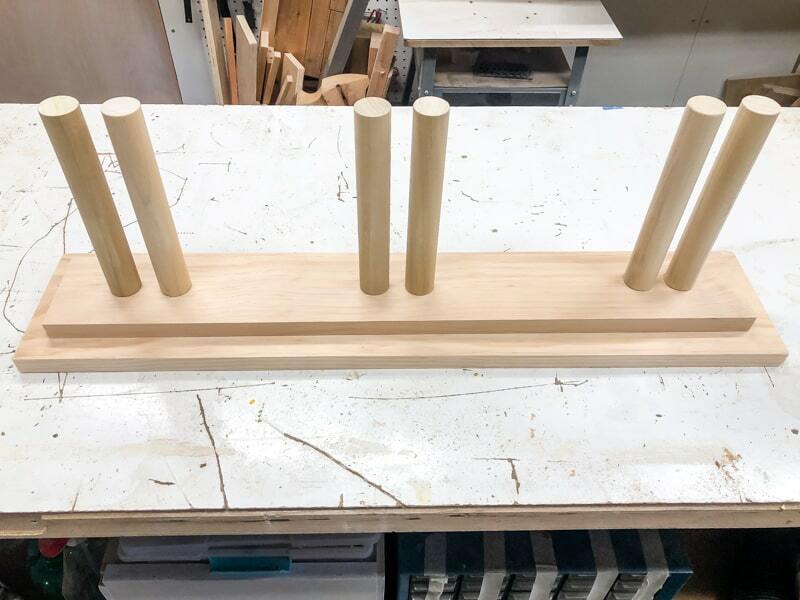 If your dowels are still a little wiggly after the wood glue dries, you may want to consider screwing them in place from behind with 2 1/2″ wood screws. This is common when the hand drill wasn’t perfectly perpendicular to the board when drilling the holes. Mine were feeling pretty secure, so I decided to skip this step. 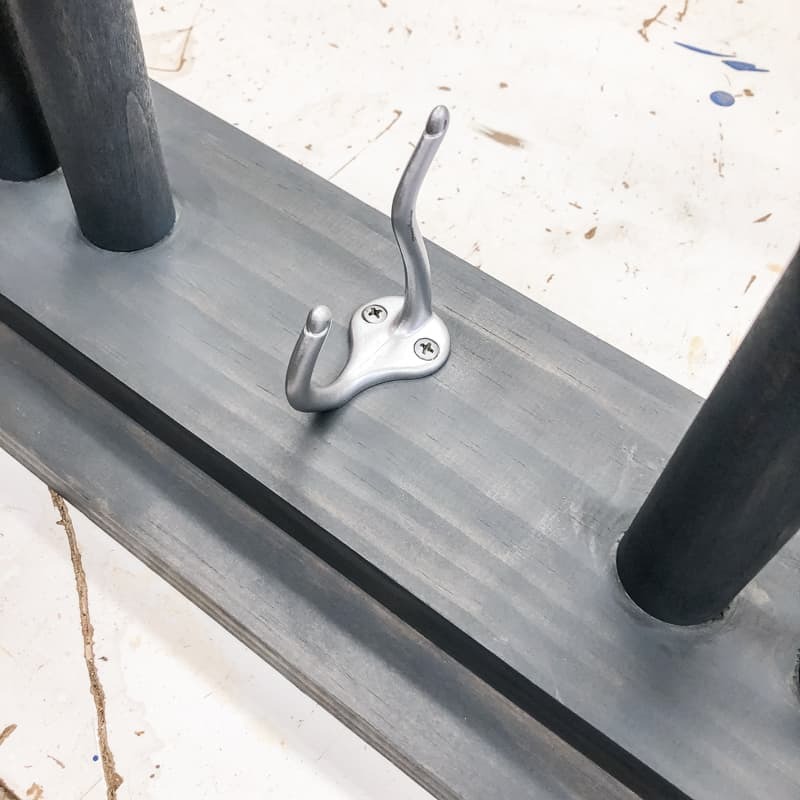 You can leave your ski rack natural, or give it a quick splash of color with paint or stain. 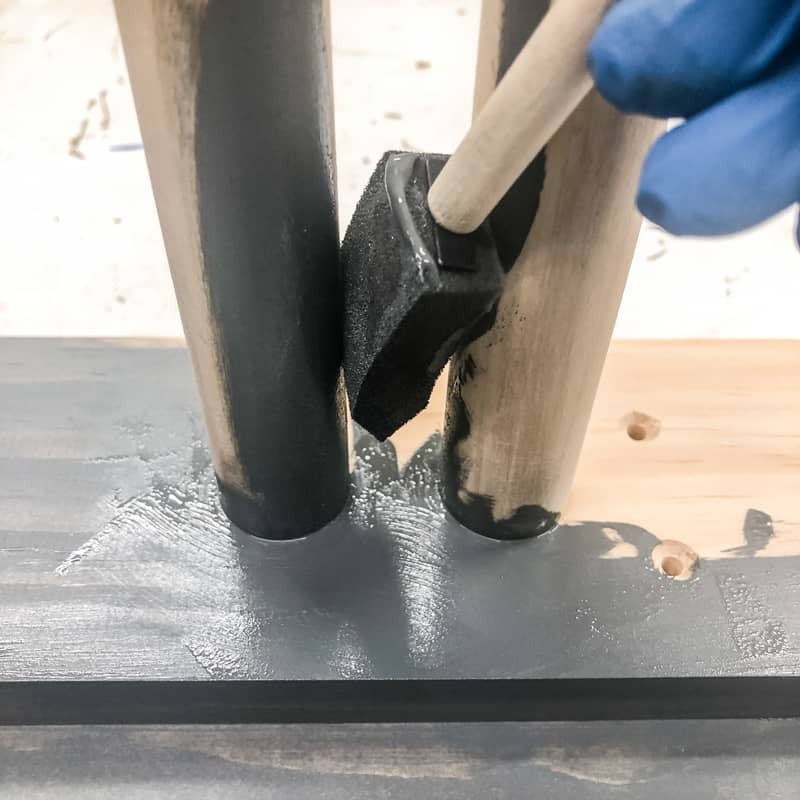 I had a little bit of my favorite grey wood stain left over from my friend’s industrial computer desk build, and the gel consistency made it much easier to apply to the round dowels without dripping! 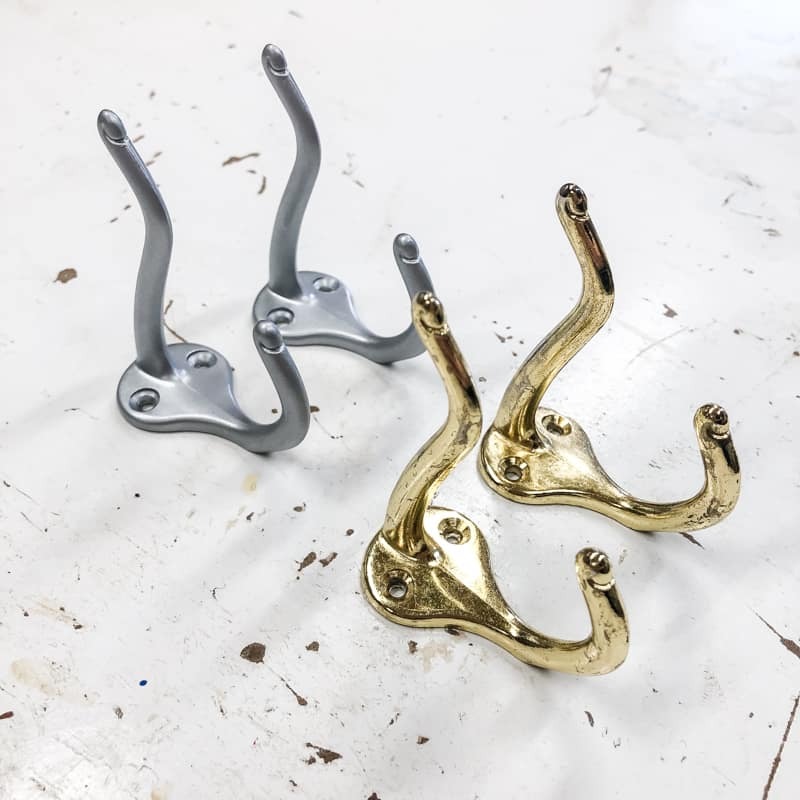 I had these ugly brass coat hooks that I removed from our stairway and replaced with folding coat hooks (no more pointy hooks at eye level when coming up the stairs!) A few coats of silver spray paint and they were looking much better! Screw them into place in between the slats to hold your poles. Mount Ski Rack To Wall and Load it up! 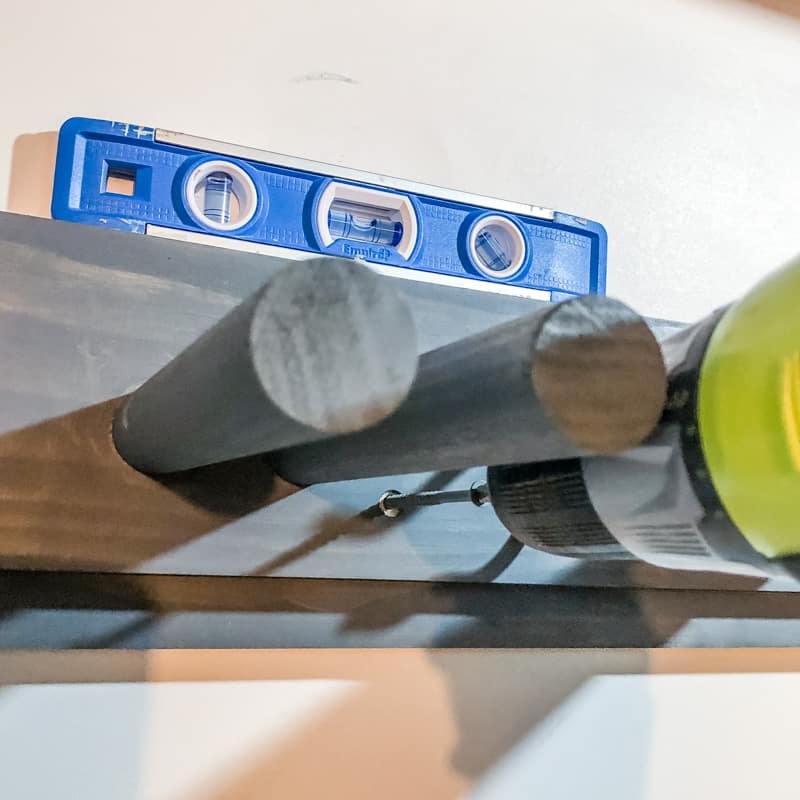 Use 3″ wood screws to attach the ski rack to the wall through the countersink holes and into the studs, making sure it’s level. 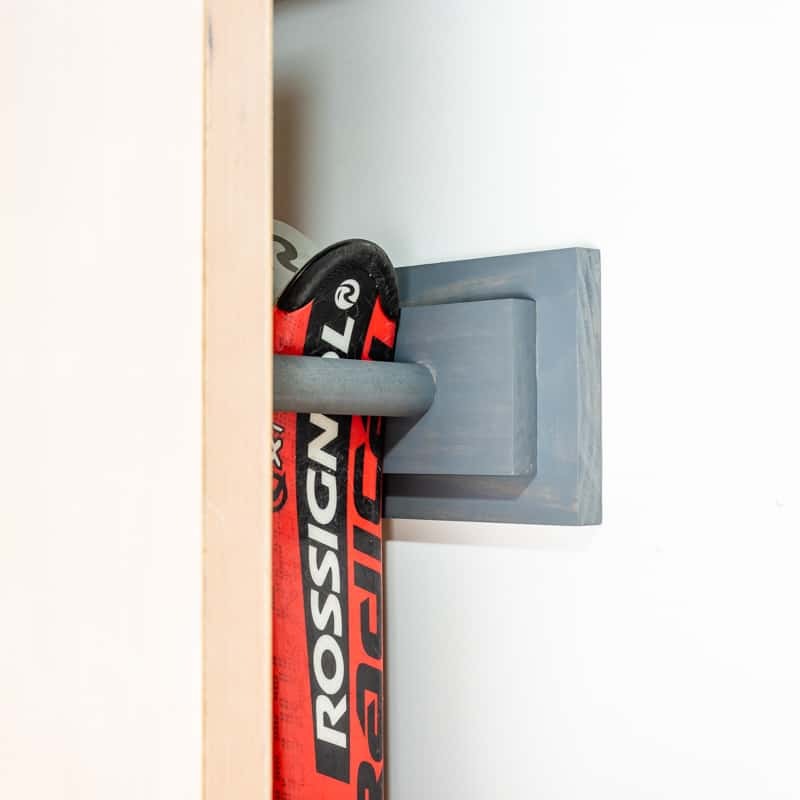 Test to make sure it’s securely fastened to the wall, then start loading up your ski gear! I love how little space this garage ski rack takes up, and puts the area behind the door to good use! Now all our gear is ready to go when the powder starts flying next winter!